At sea I had plenty of time to think about my future and my next boat. Mostly she turned out to be a bit longer than the one I was sailing but she was still very narrow. I think that such a boat will make a good cruising boat for the high latitudes sailing I like. But it will cost more, much more. And my pension? Well, luckily, nowadays I do get about 500 € a month from our government. Unfortunately that is not much to build such a big boat on. But it was tempting because it would give me a place for a bicycle and a girl and I told myself that somehow; if I only tried hard enough, I would manage find the extra money. Inspired, I worked out quite a few details for a boat 5,8 meter long with a 1,5 meter beam. As an economical back up I also did some drawings of tenfeeters. Why not? I had plenty of time and paper and it was fun. On December the 3-rd, a week after arriving in Martinique, I was in Paris. Martine, a girl who sailed with me in Anna 1968 met me at Orly. Luckily she now lived next door to the boat show that opened the same day. There I met many of the minitransat skippers and Eric Henseval, designer of the interesting SOURICEAU 4,75m. He updated me on the small boat scene. Especially interesting I found David Raisons TeamWork Evolution. I managed to get a few words with him. That a boat with such a full, round bow could win one of the hottest competitions and with such a big margin surprised me greatly. It did not take me long to realize that if I could make a tenfooter with a similar, round bow that went well to windward I would get much more space in her. Inspired I went back to my note pad. There are not many sport branches in which a man 73 years old can set a world record. The “around in ten” was one and the challenge tempted me. Besides, if I succeeded, I might as a spin off effect get rich enough to build the bigger cruising boat. The one with enough space for a bike and a girl, but most of all it would keep me healthy and give me fun and it would be a cheaper way out. Dec 6th in Paris I made the first sketch. The boat became 2,8 meter long with a beam of 1,6 meter. Its salient feature was its tacking mode. It did not tack the usual way like a slalom skier but like a falling leaf. It was a proa, athwartships as well as lengthships symmetrical; stem and stern had the same shape. There was a windward side and a leeside. It had a rudder in each end. I was able to solve the steering problem in a neat way. (– The rudder at the fore end rotated up, out of the water and became a short bowsprit. Downwind it could be angled to windward to let the jib catch more wind. Upwind it could be angled to lee to let the jib get a better, leeward position in relation to the mainsail). Because proas always have the same side to windward the stability problem was easy to solve. Just move heavy things to windward. Interestingly enough after tacking they are still to windward. But the main reason why I wanted a proa was that, that way I could divide the boat by a lengthwise waterproof bulkhead with a sliding door. I would sleep to windward in a full length bunk and control the sails from a hatch central in the leeward part of the boat on the lee side of the bulkhead. I reasoned that if I sailed in an unbreakable boat and always stayed dry and warm, I would be fine whatever the weather throw at me. I was happy and proud of my design. That is, until Dec 22. By then gnawing doubts made me realize that all was not well, that it would not only be nice to have a saloon with the same kind of comfortable seat like I had on my latest boat, but even important if I was going successfully to spend one year making an uninterrupted voyage around the world in the tenfeeter. During my latest sail, changing around was important. I spent a few hours in my bunk reading and designing, then I went back to the saloon and my comfortable easy chair. There I had something to eat or just watched the saltwater waves through the windows. After that I went back to my bed, if I did not take a short walk on deck or a long swim in the saltwater waves. That way I filled my day and life with variety. So there I was, back to square one, once again. Basically I do not like beamy boats, 1,5 meter (5 feet) is plenty for me, but I realized I had to do some trade off and swallow the bitter pill if I successfully wanted to sail the wide oceans in a tenfooter and win the world record. Reluctantly I increased the beam to 1,9 meter and the length to 3,0 meter which is just under 10 feet. My method of construction is sandwich and the hull thickness is about 5 cm (4 cm core plus laminate on each side. This gives excellent strength, insulation and flotation). That increased the maximum inside width to 180 cm. Luckily by concentrating hard I have succeeded in shrinking myself 5 cm, from 172 cm in my youth to present 167 cm. Now I had created the necessarily conditions that enabled me to draw a athwart bunk 13 cm longer than myself. That bunk would only take 80 cm of the boats 300 cm length. With that arrangement I could go back to the normal tacking mood. Regrettable I gave up the untried proa concept. Each system has its own advantages and disadvantages. Instead of a longitudinal waterproof bulkhead I draw one athwart the boat. Its door slided up and down. An extra advantage of that arrangement is that when using it as a bunkbord in rough weather I don’t have to close it completely if it is hot. That way I get more ventilation. The main hatch is then of course closed, similar to the system they use in submarines. I will have two equally high masts and sails of the same shape and area. The boat is schooner rigged. A central hatch will provide ease of handling the sails without going up on deck. The distance to each mast from the edge of the hatch will be a handy 90 cm or 3 feet, the same arrangement that has proved itself so handy on my present boat. Each mast has two different sails. In strong winds I will use trysails attached to the masts with pockets similar to windsurf sails. Instead of the wishbone I will use a straight horizontal sprit. The masts have no tracks and the sails no slides, one less thing to malfunction on a long voyage. It also makes the masts stronger for the same weight. In good weather I will use balanced lugsails with an area of 4 to 5 square meters each (44 to 55 square feet). Balanced lugsails are not attached to the mast with neither slides nor goosenecks. Therefore when the wind pipes up all I have to do is to bundle up the lugsail, including its spars and tie it to the deck and hoist the 1,5 square meter (15 sq ft) trysails. They are permanently positioned around the root of the unstayed masts. The downhauls are always attached to each sail, saving work and guaranteeing that I do not loose them a dark, windy night. Out there it is far to the next sail maker. The unstayed, round, tapered, carbon fiber masts are not longer than 12 feet and not very heavy. They can easily be moved. In the forward part of the boat there are two extra holes to put them in, one on each side of the deckhouse, 80 centimeter distant from each other. For downwind work the masts can be moved to these holes and the sails set goosewinged. The distance between the masts prevents the balanced lugsails from interfering with each other. The full scale sailing model will tell me if it is worth the extra complication. There will be two rudders on the 1,6 meter wide transom angled outward at 20 degrees. In heavy weather, going down wind, the parallel stay can be shortened wedging the rudders, trailing edge outward. This will act like a brake and decrease the boats speed significantly. As seen under a previous post (A TEN FEET CRUISER IN BIG WAVES) it will also more effectively glue the boat to the wave surface. In a slow moving boat, the acceleration is always at right angel to the wave surface. The angled rudders will help to prevent broaches as the rudder on the broaching side have a bigger angle of attack and creates more steering power. The other rudder will loose its power. There will be daggerboards in the rudders to increase their draft when so needed. The forward lateral area consists of two side by side (not tandem) daggerboards. The advantage is more control, and I am a control freak because only complete control over the boat makes me happy at sea. Also that arrangement moves the center of lateral resistance higher up. Therefore the boat heels less. A tall rig heels the boat more than a short rig. Likewise the equally big force of a deep lateral area heels the boat more than a shallow lateral area. Enough of that for now, because the most frequently asked question, I guess, is: “Will there be enough displacement for me, all the food, water, books and the hundreds of other thing I will need for a year at sea in a ten feet boat”? I wish that my readers had kept their ears open during the mathematical lessons in school. A good boat builder keeps his tools sharp, but in my opinion he should also keep his mental tools sharp and mathematics is by far the sharpest mental tool. The following is really a very elementary calculation. But one step outside the normal behavior and a person is a child in a new world and has to forget all he has learnt to get a realistic understanding of the new phenomena he encounters. Going back to the fundamental principals with the help of a little elementary mathematics clear things up. Let me explain. Frank Andreotti sailed across the Atlantic in the boat Stern. It was 1,72 meter long. The total weight of the boat, food, water, skipper and everything else was 450 kilo. His average speed was 2,5 knots. Now if I was going to scale up his boat to 3 meter in all dimensions length, beam and depth (do not worry. I am not going to do it. This is just and example of elementary mathematics) I would get 3 divided by 1,72 cubed. That number is 5.3. Multiplying 5.3 by 450 kilo I get 2387 kilo or 5278 pounds of displacement in the new 3-meter boat. This is surely more than enough. It is nearly two and a half tons. 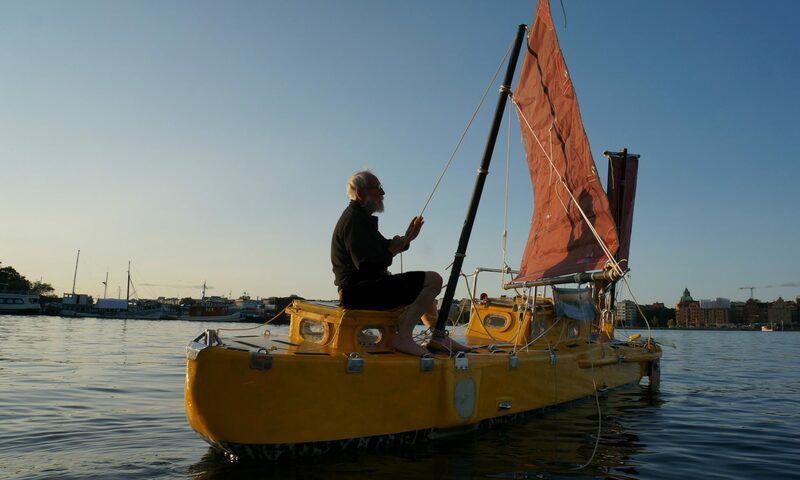 Who could have guessed that a wind powered 3-meter boat could carry that much weight? The speed would increase by the square root of the scale or 1.32 times. This will increase the average speed from 2.5 knots to 3.3 knots. The new boats stability will increase by the forth power of the scale factor or 9.25 times. That is, if you before could put one person a certain distance from the center without the boat healing to much you can now on the up scaled boat put 9.25 people that same distance from the center. (The number comparing the big boats stability with the smaller one comes from multiplying the new displacement by the new healing arm). This proves that I will have ample margin of stability for the stronger winds I am likely to encounter in the roaring forties. To keep my heart, lungs and blood vessels fit, I will try to build a hand and foot operated generator. My first plan was to sail from New Zealand to the Falkland Islands via Cape Horn and make a stop there. During the southern winter 1980 I cruised the islands during four months in a home built 19 footer, so I am familiar with the waters, although I realize that much of the peace are now gone. The war has changed that. Also I have been told there are still some plastic mines left despite thousands of sheep’s walking about trying to clear the ground. I really do dislike cutting up a passage into many small parts. Also in the back of my mind there is the American proverb: “If a job is worth doing, it is worth doing well”. Clearly the least hassle humans can give me is if I circumnavigate the world non-stop. The more I thought about the idea the more attractive it became. The more I analyzed the project by going back to the fundamental principals the more feasible it seemed. This is the big picture, but of course, the devil is in the details and they will take time and ingenuity not only to work out, but also, equally important and more difficult, make sure that they do not interfere with each other. So with many good ideas and one “idée fixe” I have decided to go ahead. However, do not hold your breath I do not have much money and my speed of work has dropped as my years has advanced, nor do I have a young female adept helping me as I often had in my younger days when I was more beautiful. Also nowadays I am more careful and there are still many problems to solve and calculations to do.